In previous article we’ve reviewed general concept of REST. Now we will implement some basic REST service. And our approach will be - test methods before, implement them later. I’m talking about kind integration tests, the tests that would act exactly as your client, making real calls to storage and return real results. I will use jQuery and qUnit as my weapon of choice. Like in case of FuncUnit it is easy and fun to create those tests. Why should I start from tests? Pretty simple, by implementing tests before you are looking on your service as client<, not as a developer. When I was working to version 1 of my REST API I didn’t do any tests, basically because I didn’t know how to do them. When I was ready and started implementation of the client code and documentation, I found out major API issues that I had no time to solve. Those issues were related to: design, security, formats and convenience of usage. TDD principles works the same here: clear and simple design through series of tests. Internal If/else statement could be extended with some specific result codes you might expect. If API call has been finished successfully, result JSON object will be parsed and submitted to a test callback. All tests requires a setup. In integration testing we basically rely on existing environment (the same that will be used by real application). Due to security reasons all API calls receive an api token as first argument for any call. Api token is received after successful authentication, so a StartUp for each test we need to login, receive api token and only then proceed with method tests. For qUnit is is natural to place this code to module setup. Module holds API URL and token, so they are reusable through the rest of tests. If setup failed to authenticate, all tests would be failed because they could not use any call without token. Rest of tests are available on github, check it out to get additional ideas. 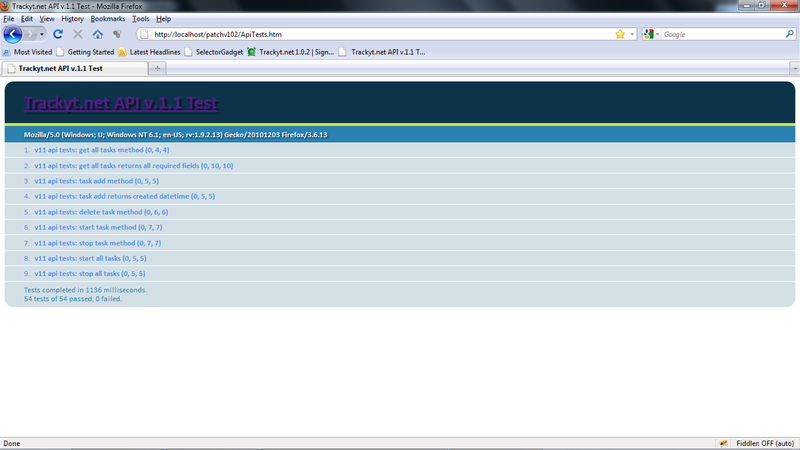 As any kind of qUnit tests they could be easily run in browser. For continues integration system, they have to be run from command-line. It is easily possible using FuncUnit + Selemium Server and described here. Sure, you need to be able to run tests under debugger to see what might went wrong. 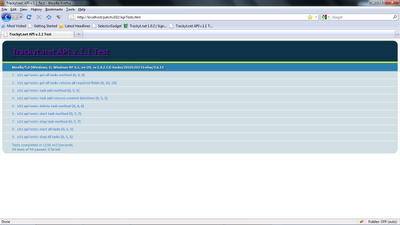 For debuging test code, there is nothing better than FireBug. Just place the breakpoint on a line you need, press F5 to restart tests. If you need to debug actual API implementation code (which in my case is C#/ASP.net MVC application), I start the web site under debugger (F5 in VS2010), place breakpoint in corresponding method and press F5 in browser to to restart tests.